Italian Prime Minister Silvio Berlusconi answers journalists questions in Strasbourg, France, on July 2, 2003 (Photo: Thomas Wirth/AFP-Getty Images). Apart from the usual journalistic excesses that occur whenever Italy takes on a leading role in the world, the controversy characterizing the beginning of the six-month Italian presidency of the European Union (E.U.) springs from a wrong assumption: the idea (curiously shared by both Prime Minister Silvio Berlusconi and his adversaries) that the period starting today will be unlike any other on the normally complicated European agenda. Without taking anything away from the importance and difficulty of the problems that are on the table, it might be helpful to remember that this is the 58th European presidency, and the sixth one led by Italy. Remember that in Europe our country has always been more or less deserving of merit for putting aside its prime ministers’ ambitions, programs, and character. Italy, feeling strong on account of its tradition and the respect it commands as a founding father of the Union, has contributed to important accomplishments in E.U. history. Italy is always well aware, however, that the fundamental, unwritten rule for belonging to the “club” is that here it is necessary to learn to be different from oneself, detached from one’s own interests, and master of the art of the possible as the foundation of good policy. [Former Italian Prime Minister Giulio] Andreotti was not quite himself when in 1990—by repudiating his nature, his personal history, and the 40-plus years of the Christian Democratic Party’s predisposition to temporizing—he constrained [former British Prime Minister] Margaret Thatcher to approve introduction of a single [European] currency during Italy’s second to the last presidency. Yet the decision to enter the euro system—the decision remembered in history—was not made until the following year, in Maastricht. [European Commission President Romano] Prodi and [Italian President Carlo Azeglio] Ciampi are the two players who actually made it possible for Italy to enter the euro system; in fact, Prodi and Ciampi led the positive Italian phase of the reorganization of state finances that enabled Italy to meet the high standards of entry. This is to say that, very often, historical events are prepared in a given six-month period but then actually take place in one of the following. This happens for good or for ill, as European history teaches us: In fact, at the beginning of the E.U., [Germany’s first postwar chancellor, Konrad] Adenauer, made a mistake when he promised Turkey, or led Turkey to believe, that the doors of the E.U. would open up for it. It was [former German Chancellor Helmut] Kohl, the spokesman for a large majority of dissenters, who had to pull back from the founding father’s words and deny Turkey acceptance to the E.U. Then history gave the German leader a Turkish daughter-in-law, and over time also a measure of familiarity with the country facing the Bosporus. The last two [E.U. Council] presidents, [Anders Fogh] Rasmussen and [Costas] Simitis, have obtained different results from their semesters of presidency. The former, regarded by everybody as a beginner, proved himself by dedicating himself passionately to his task during the intergovernmental conference for the E.U. convention. The latter had to deal with the war in Iraq and the most serious disagreement in Europe in the past 20 years, but, in fact, he couldn’t do too much, if anything at all. By the same token then, we can foresee that Berlusconi’s success or lack thereof will depend not on his agenda or the events awaiting him. (The agenda he inherited was worked out in Copenhagen at the end of 2002 and did not give him much choice.) And already in 2001, the attacks of foreign journalists on Berlusconi could not jeopardize his political victory or his subsequent successful active role in foreign policy, which he enjoyed as acting minister. 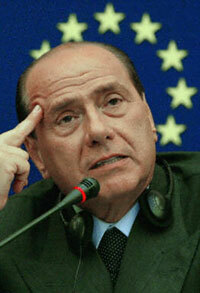 More important, the decisive winning elements in Berlusconi’s E.U. presidency will depend on the strength of his negotiating style. Berlusconi will have to operate and negotiate in situations in which his partners will try to promote their own causes. He will have to juggle to include or exclude parts of the constitution according to the needs of other countries; finally he will have to keep an open dialogue for further amendments. Berlusconi will need the wisdom and authoritativeness to understand that nothing is ever really accomplished completely. Italians have been behaving well: pretending to be different but remaining faithful to their deepest selves.